Here’s a recap of Saturday and Sunday (days 2 &3) of Woodworking in America 2016. Saturday was a fun day of workshops and lectures. 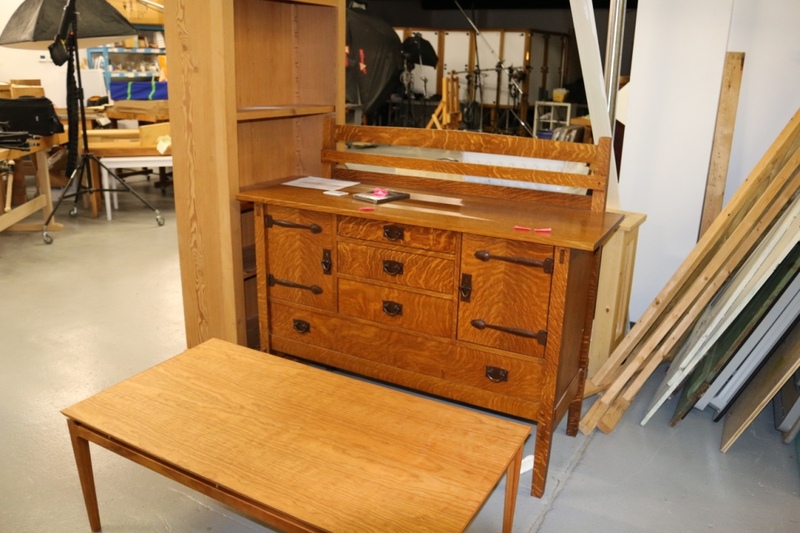 I watched a great talk by Caleb James on Danish Modern furniture. Chris Schwarz had a talk about Chairmanning and a talk about his Roman Workbenches. Roy Underhill demonstrated how to make a classic coffin. Mary May demonstrated how to carve volutes, C-Scrolls and other similarly projects. I also had some fun guarding Chris’ low Roman workbench as I helped Roy get it out to his van. I got to see some more old friends, meet some new ones and meet several friends I knew from being online, but not in person. I got to meet Mike Flaim and had a brief interview with Dyami Plotke of MWA. In the evening we had an event where we went Rhinegeist Brewery for some very good beer and BBQ followed by a tour of some of the massive underground brewing and beer storage tunnels that are under much of Cincinnati. Another great view of the Cincinnati waterfront. Caleb James’ excellent presentation on Danish Modern furniture. 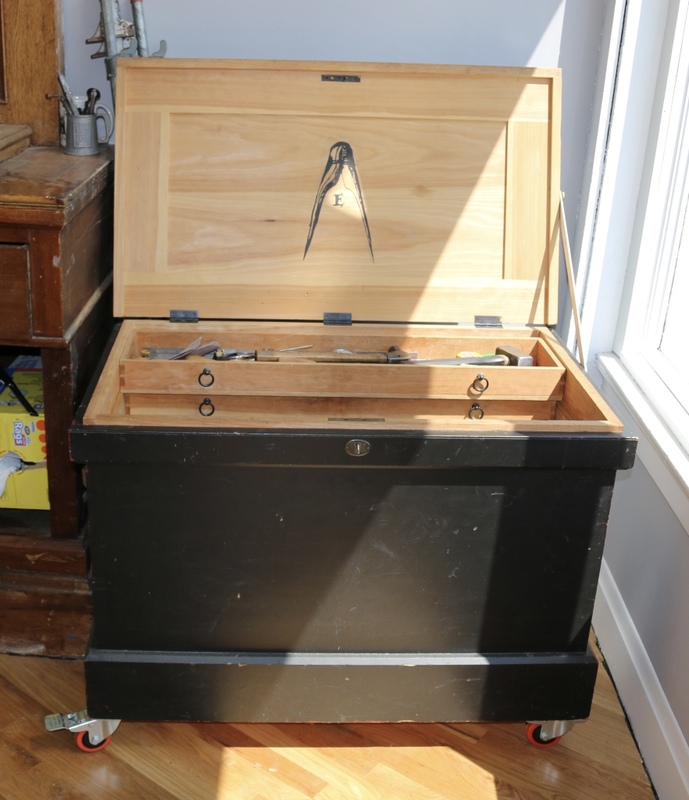 Caleb’s traveling tool chest with a large collection of the planes he’s made. A table from Caleb’s presentation we all hope to see in an article at some point. Zach Dillinger with his very nice reproduction ottoman. Zach Dillinger taking questions as the end of one of his workshops. Quick selfie with my hero, Roy Underhill. It’s always great to see him and he’s very nice to all of us fans. You know Roy Underhill’s presentation killed — there were a LOT of coffins all over the room. Chris demonstrating how versatile the low bench is for preparing stock. Taller Roman Workbench with Chris hand rasped nuts. Chris cutting wedges for his chair leg tenons. Double wedged tenons in the Roman Workbenches to close up any gaps. The nicest bus stop bench in Covington, KY. Guarding Chris’ low Roman workbench as Roy went to get his van. Selfie while laying on a Roman bench in the middle of a city sidewalk. It was OctoberFest weekend in Cincinnati — the largest outside of Germany. Made my German ancestors happy to try all the brews and see all the folks in Lederhosen and Dirndls. Folks jousting American Gladiator style in full on lederhosen. Pig sticker fence. I also really like how the guy restoring this row house painted the CDX on the door to look like a door and even layered it on the windows and painted them to look a bit like sash. Nice touch. About to enter a spooky underground brewing cave that has even been in some recent movies. Gives and idea of how big some of these brewers were back in the day, under a large hill in the city. There might even be a ghost in this photo…. A paddlewheel sightseeing boat out on the river. If you’d like to see my photo recap of the first day of WIA 2016, please check out this earlier post here. I had a great time at the event and hope to see many of you there next year. 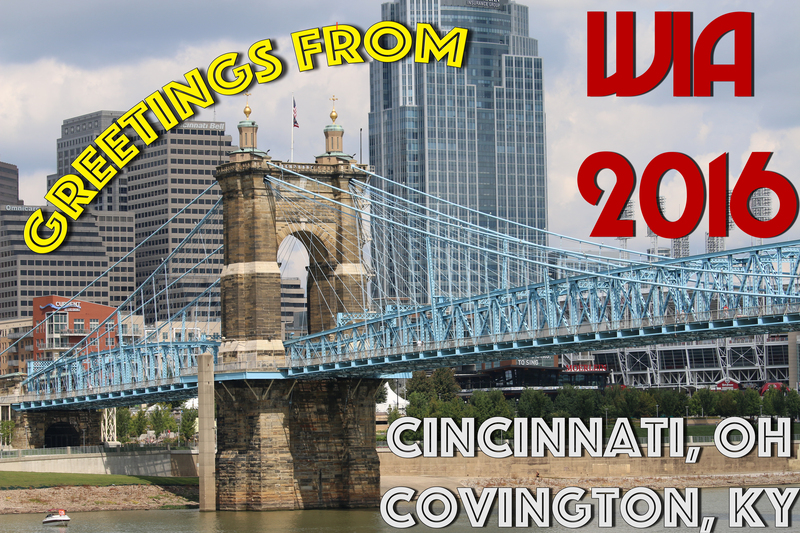 Here’s a recap of my first day at Woodworking In America 2016 — held at the Northern Kentucky Convention in Covington Kentucky which is part of the greater Cincinnati Ohio area. This was my first time attending this conference and other than a nightmare of a time getting there by plane from NH (Thursday night flight cancelled, the second set of flights Friday at the crack of dawn, missing the connection due to ground staff incompetence and fighting to get on another flight later in the day) and missing the 2/3 of the day’s lectures I still had a very nice first day watching Freddy Roman’s presentation, exploring the brew and browse event, meeting a ton of friends old and new and meeting several online friends in person. I also had a great dinner with a great bunch of folks — Zach Dillinger, Mary May, George Walker and many others. Freddy Roman giving a talk on sand shading and inlay. Some of Freddy’s banding stock samples. Freddy Roman demonstrating some fine detail work. Very neat sample board of some incredibly tiny and intricate banding Freddy acquired and has worked from. David Thiel of popular woodworking tweaking his camera. I always think photographs of other photographers are fun. The new Crucible Tools — hold fast and dividers. Very nice looking. Brendan Bernhardt Gaffney and George walker looking at Brendan’s new sector prototype. Prototype Sector by Brendan. Definitely going to get one soon. SAPFM booth with the hand tool olympics. I’m proud to say I did will with my cutting events. Lie Nielsen Toolworks with Mr. Lie Nielsen himself. Deneb Puchalski of Lie Nielsen Toolworks giving a demo. Deneb is a great guy and I’ve been buying tools from LN for many years and he’s been my main point of contact for most of it. Jason Thigpen of Texas Heritage Woodworks making a great face. A nice rocking chair by ne of the exhibitors. Wish I could recall his name, but he was offering online courses, one of which was on making this chair. Up next is a post about the second two days of the conference. I had a great time and hope I can attend it again in 2017. Back in May I spent a couple of days in Cincinnati Ohio on my way down to Harrodsburg Kentucky for the EAIA Annual Meeting and a quick stop in Covington Kentucky on my way home to visit with some of my woodworking friends in the area. My first stop was at the Popular Woodworking offices and studio to see Megan Fitzpatrick and David Thiel who graciously showed me around. The office building while nondescript from the outside contained an interesting space on the inside. 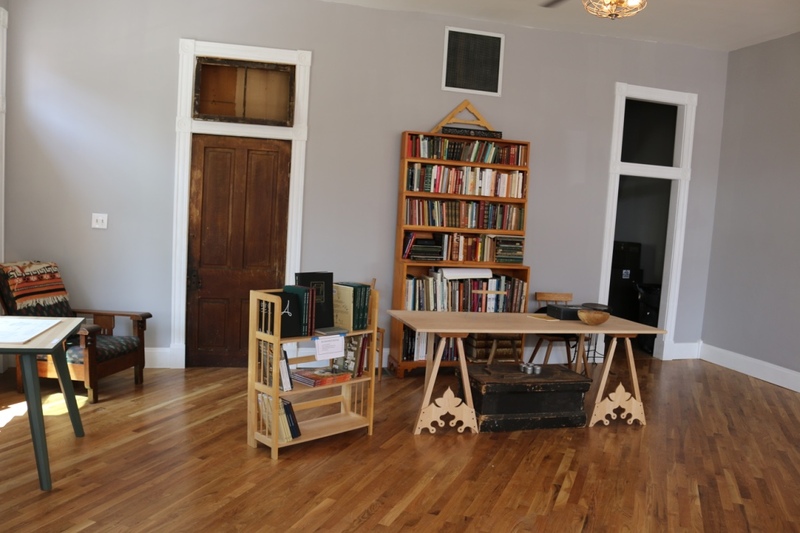 A mixture of office space, editing bays, studio/soundstage and a woodworking shop. 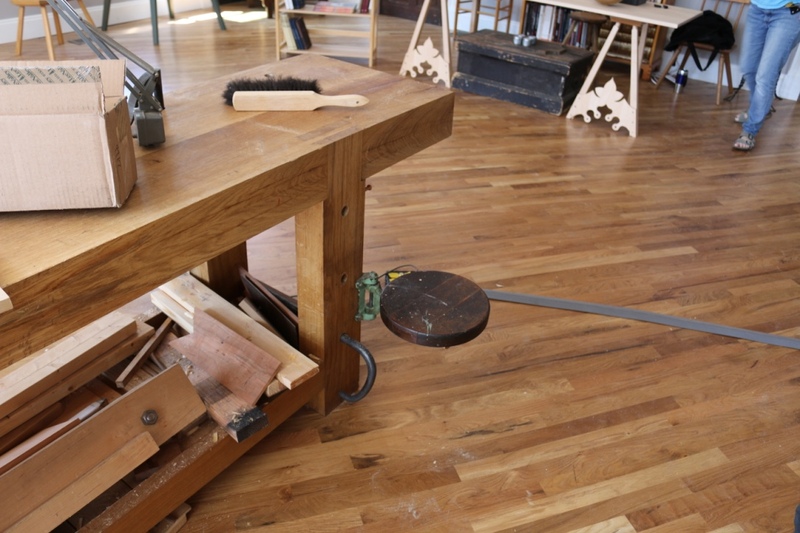 In the warehouse space you could see several projects from Popular Woodworking and American Woodworker magazine. If only we had room in the car to buy one and bring it home. 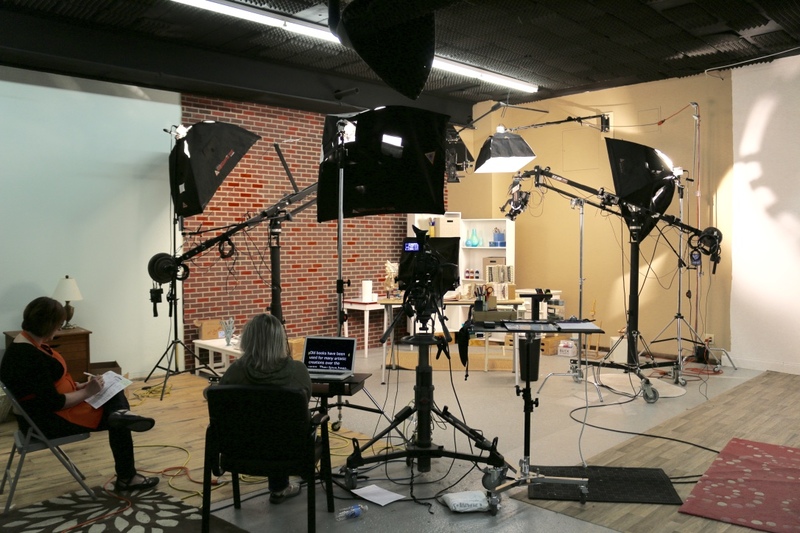 In the studio area I was able to see another F+W project video being recorded. Out in the woodworking shop I felt right at home. There was a large machine and bench room. 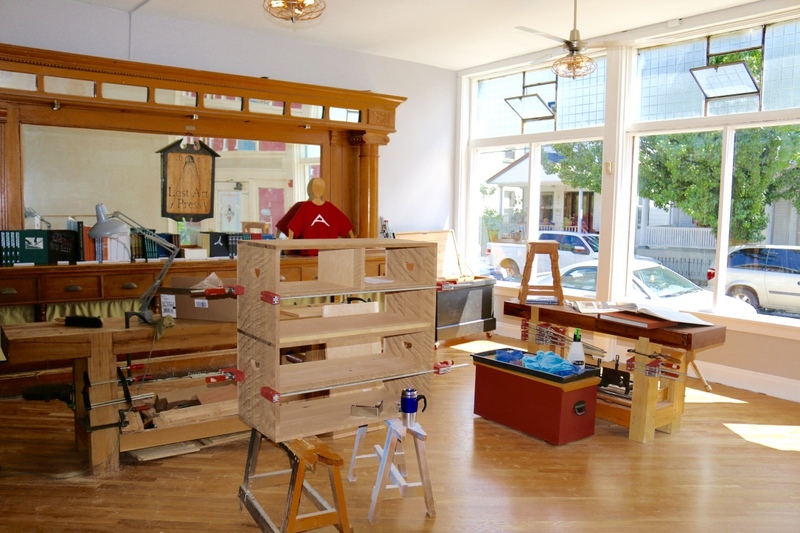 In the corner I could see Megan’s workbench and the windows you may recognize from many an article and post from Popular Woodworking over the years. I was too busy talking David’s ear off and didn’t take a picture of him to include in the post, but I’ll make sure to take one next time I am in town. On the way home from our trip I also stopped in Covington KY (right across the Ohio river from Cincinnati OH) to visit Chris Schwarz at the Lost Art Press storefront. The storefront is a nice historic building that used to be a saloon in a part of Covington that reminds me a bit of Brooklyn — lots of history, artists, hipsters, good restaurants etc. After watching the build out via many of Chris’ blog posts it was neat to see it in person and to see several of Chris’ recent pieces in person. 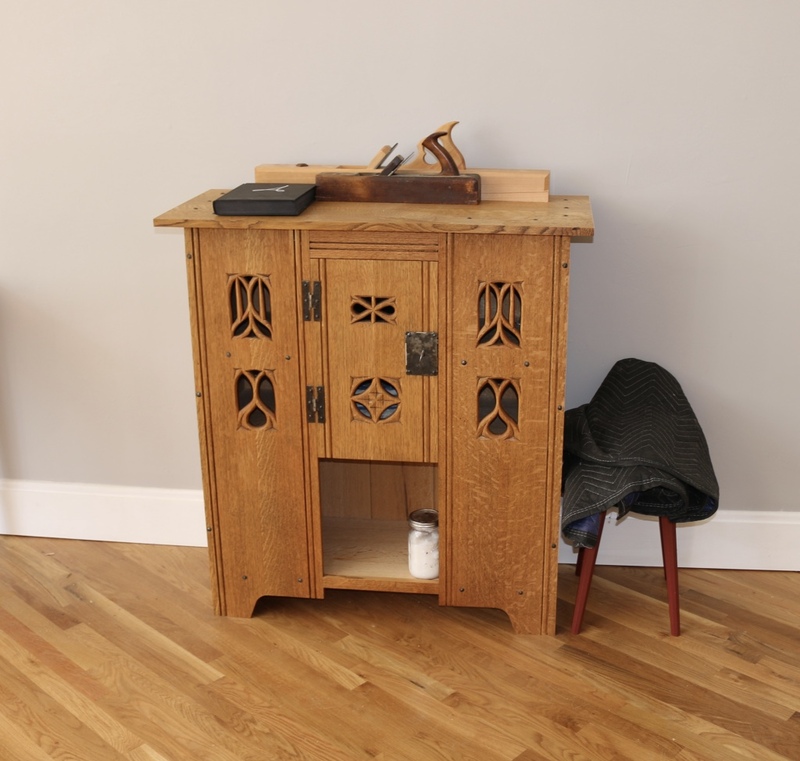 You may recall the Aumbry above from the cover of a Popular Woodworking issue earlier this year and from the Anarchist’s Design Book. I had fun talking shop with Chris and Megan and checking out some of the recent bits of hardware he picked up. 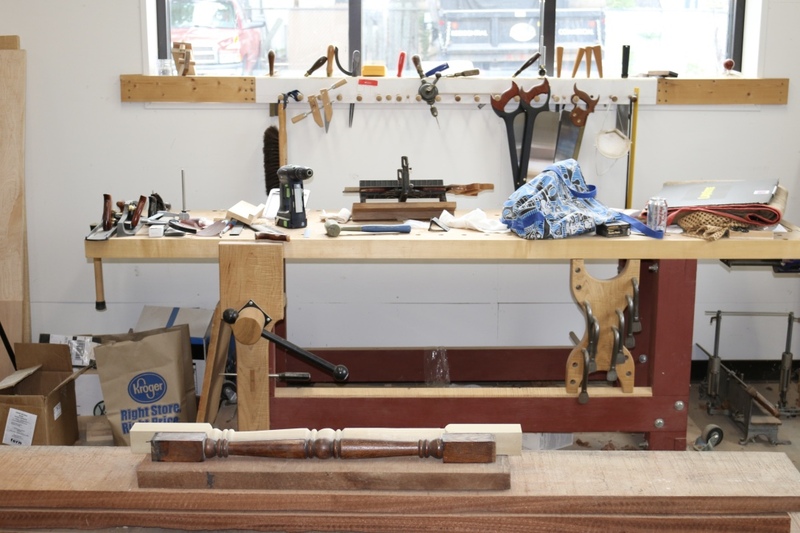 The adjustable swing out seat he added to his bench was a nice addition I’d love to have on my own bench someday for carving and other detail and design work on the bench. This was my first trip to Cincinnati and I had a great time exploring the city. In fact I’ll be in the area again in September for Popular Woodworking in America. A big thank you to Chris, Megan and David for showing me around and a big thank you to my wife Alyssa for wrangling the babies while I geeked out with fellow woodworkers. 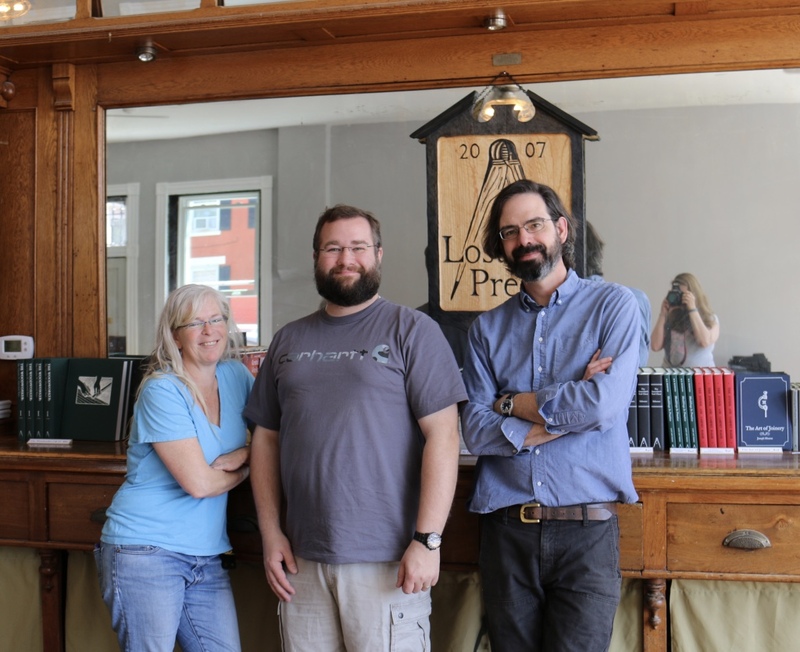 For more information on the Lost Art Press you can check out their website here. 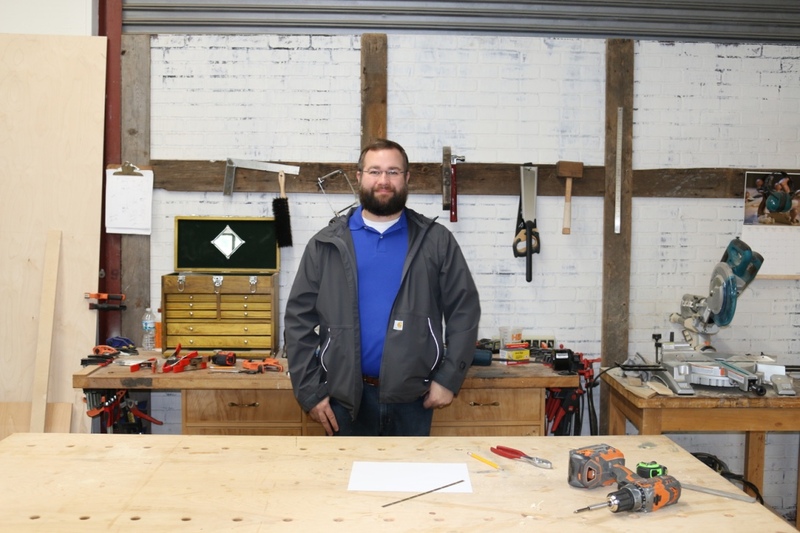 For more information on Popular Woodworking you can check out the magazine’s website here. For information on Popular Woodworking in American 2016 you can check out their site here.